If you are looking for something a little more distinctive and unique, then why not try illuminating your abode with a bit of candlelight? And for a truly medieval style, do so with one of our dragon candleholders, all of which feature impressively styled and detailed dragons for you to collect, display, and admire. 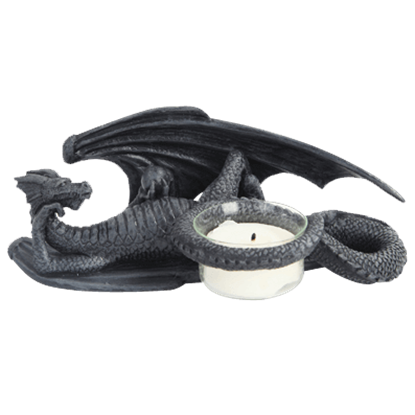 Like dragons themselves, our dragon candleholders come in a wide variety of shapes and sizes, ranging from cute little dragons that can hold tea lights to great, grand dragons that can hold twin candles on the wall. Some of the dragon candleholders here are little serpentines beasts that curl around glass candle holders like little medieval decorations, accenting the item with their very form, while others are stunning sculptures that depict great dragons actually holding up your candles. Though varied in style and structure, all of our dragon candleholders share a few things in common. All are quite impressively detailed and designed, enough so that each one is not just a great candleholder that is ready to support a source of ambient light, but also a great decoration and display item that will leave onlookers speechless when they catch sight of it, especially if it is accented by the flickering glow of a lit flame. 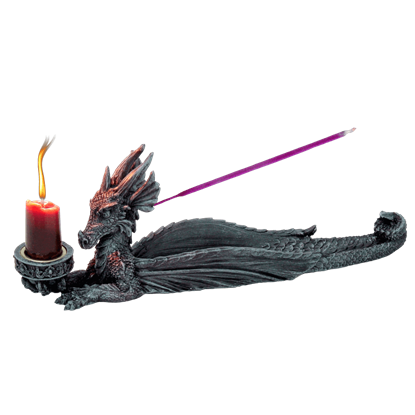 Fire and dragons have always gone together, so it makes sense to pair your favorite candle with one of these great dragon candleholders. 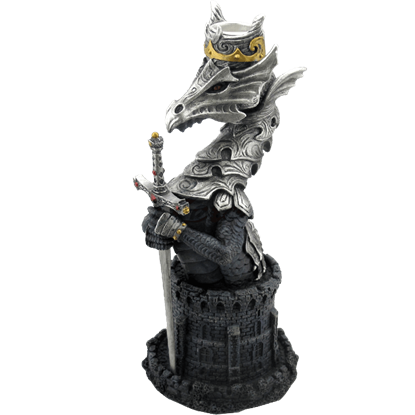 Donning armor like the men who try to hunt him, the mighty dragon on the Armored Dragon Candle Stick thinks as a noble and worthy warrior rather than beast. Crafted from polystone, this candlestick holder is a truly unique piece. Curling around a cross, this grim dragon rests its snout near the silvery pentagram marking its center. 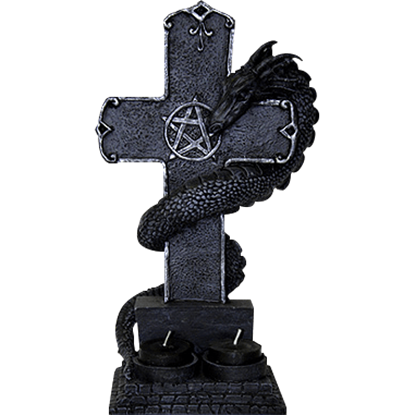 Whether the snake-like drake of the Black Dragon Cross Candle Holder is sinister or protective is up to your own imaginings. Though often seen in flight, at other times dragons retreat to hideaways in caverns where they rest among their hoards. 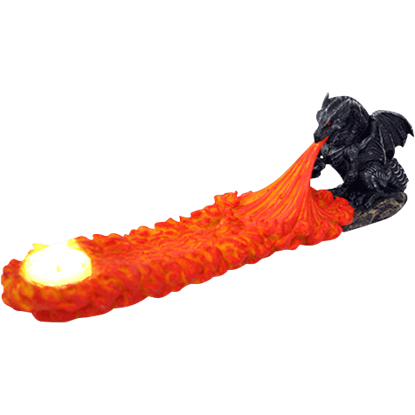 The Coiled Dragon Candle Holder reveals a reclining dragon with its tail curled around a votive candle. 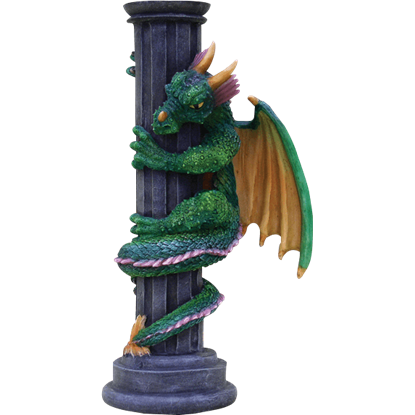 A dragon wrapping a pillar is the base of our Colorful Dragon Candle Holder. This decor piece is made from cold cast resin and depicts a vibrant green dragon with other colorful accents. The top of this statue features a candle holder. This candleholder features three dragons with their backs together each holding a tapered candle above its head and one in the middle. The dragons are sitting on a circular base with Celtic designs around the outer edge. Dragons do not respect the protection implied by the thick stone walls and guarded towers that normally keep a castle safe. 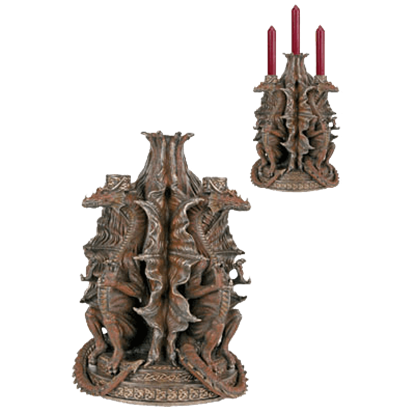 The Dragon Castle Candle Holder depicts a dragon dwarfing the castle upon which it perches. Even the thick stone and strong walls of a castle cannot protect against an attack from the air. 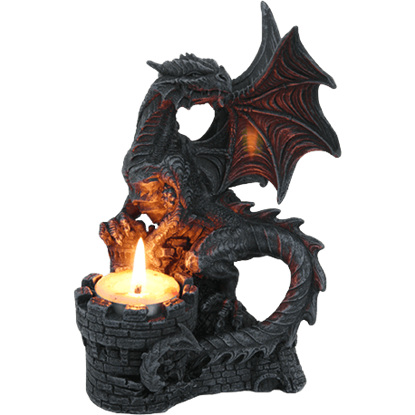 The Dragon Castle Turret Candle Holder depicts a dragon gripping a turret where a candle can burn like dragon flame. 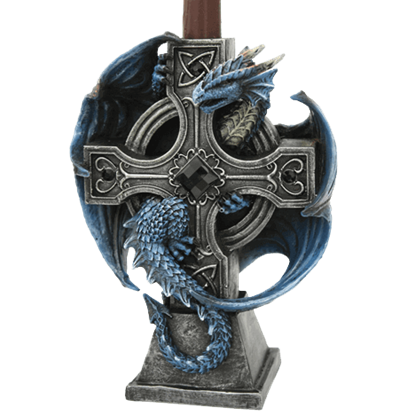 Add the Dragon Cross Candle Holder to your home decor for Celtic style with a draconian twist. This candle holder features a blue dragon wrapping itself around a Celtic cross, the top arm of which can be outfitted with a candle. 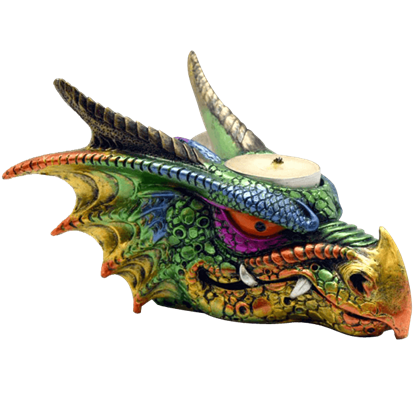 The power of dragon fire cannot be overstated, its fury visible in the design of this incense holder. The Dragon Flame Incense Burner displays a crouched gray dragon at one end with gouts of fiery breath forming the tray. 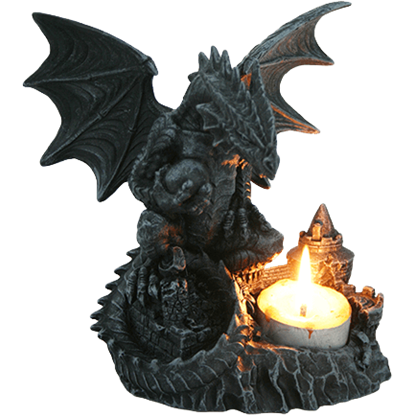 Illuminate your home with the spirit of a dragon when you enhance your decor with the Dragon Head Candle Holder. This unique tea light holder depicts the head of the fearsome creature hand painted in a rainbow of iridescent hues. Two dragons intertwine and gaze eye to eye, creating a heart shape with their arched necks and intertwining tails. 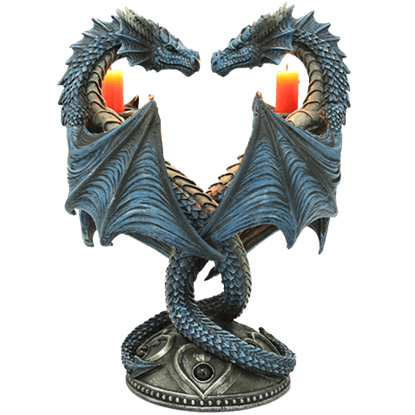 The Dragon Heart Candle Holder displays this romantic scene, made even more heartwarming when used to hold candles. Dragons are no strangers to smoke and fire. In fact, they often enjoy being around them, especially when the smoke and flame are the pleasant results of the accents that the Dragon Incense Burner and Candle Holder can accommodate.